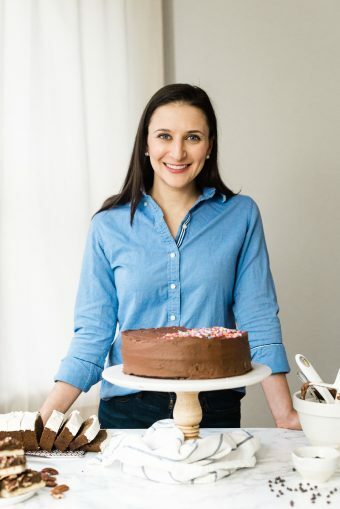 I’m revisiting recipes from the early days of A Clean Bake and making them even more irresistible! 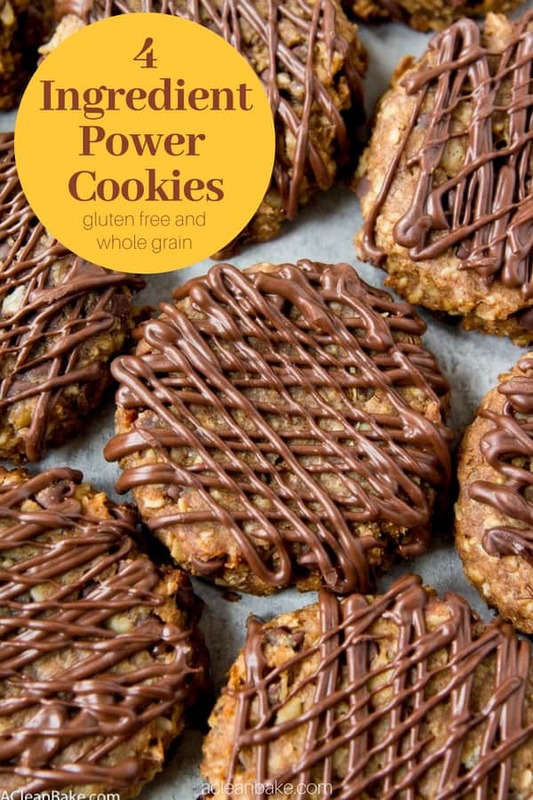 These Four Ingredient Power Cookies are an update of a recipe from 2013. They’re gluten free (not paleo, though), vegan, egg free, dairy free and whole grain for lasting energy. I’ve started the process of going back to old recipes – and I mean old; this one was originally posted on the blog that existed before A Clean Bake! – and sprucing them up. Nothing major. You know, just remaking and tweaking the recipe, reshooting the photos and somewhere along the way DRENCHING THEM WITH CHOCOLATE (the cookies, not the pictures). It’s fun, actually- the whole process, not just the chocolate-drenching. Seeing how far my photography has come is incredibly gratifying but re-reading the old copy has really given me a few good laughs. I needed a pick me up, and oats were, back then, a go-to food for me. 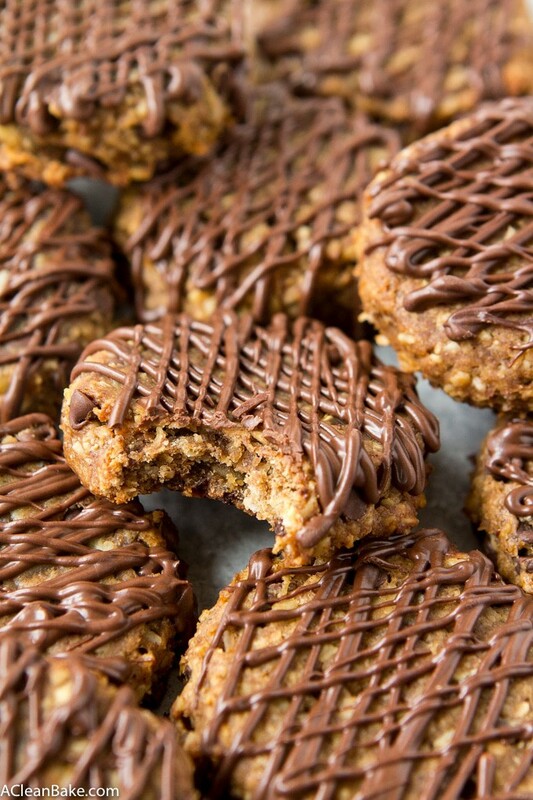 So these cookies were born of a need for energy and a love of oats (and at least one of those things hasn’t changed). That was in the days when cookies were almost exclusively made of (white, wheat) flour, and butter beaten together with (white) sugar. 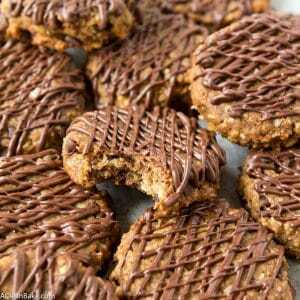 So the idea of making a cookies out of peanut butter and whole oats was… revolutionary. My, how far we’ve come! I'm revisiting recipes from the early days of A Clean Bake and making them even more irresistible! 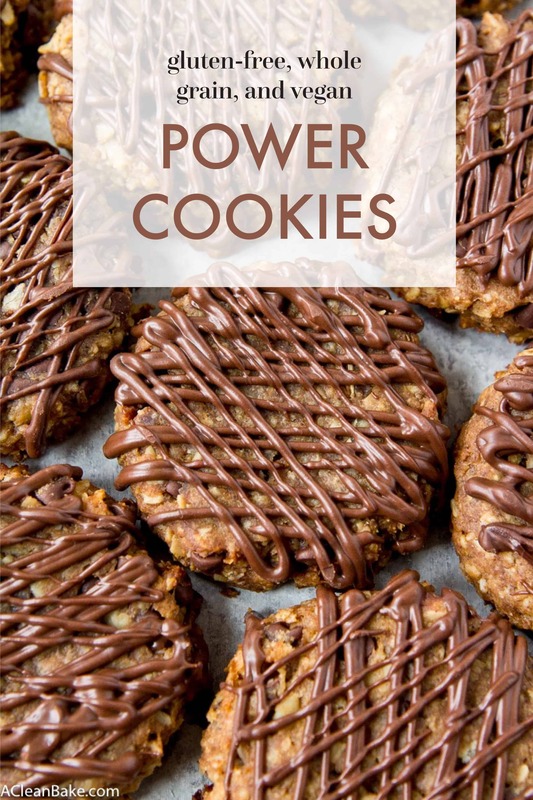 These Four Ingredient Power Cookies are an update of a recipe from 2013. They're gluten free (not paleo, though), vegan, egg free, dairy free and whole grain for lasting energy. Preheat the oven to 350. Cover a baking sheet with parchment or a nonstick pad. In a food processor combine all the main ingredients (no add-ins yet). Pulse until the oats are broken into small pieces, the banana is no longer visible, and the whole thing has formed a thick paste. If you are using any add-ins, transfer the dough to a mixing bowl and fold them in. Divide the dough into 2 Tablespoon portions. Roll each into a ball and flatten slightly with the palm of your hand before placing on the prepared baking sheet. Bake for 15-20 minutes, then remove from the oven and allow to cool for 5-10 minutes on the cookie sheet before transferring to a wire rack to cool completely. 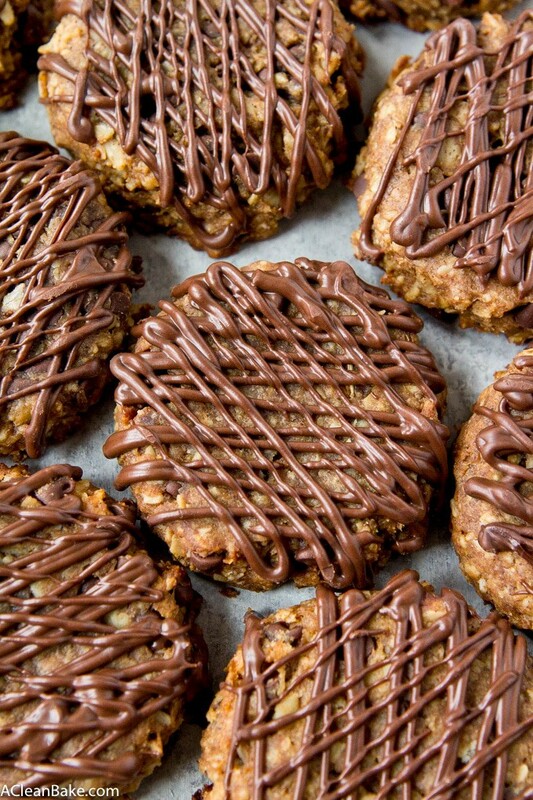 Optional: If drizzling with chocolate, wait until the cookies are completely cool before adding the drizzle. Store in an airtight container for up to five days, or freeze for up to three months. These look delicious! Love that they’re naturally sweetened by the banana 🙂 Pinning! Definitely look delicious. How’s the texture like? Pretty dense and lots of texture from the oats! If drenching things in chocolate is wrong, I don’t want to be right! 😉 These cookies have my name written all over them! If you are a person who gets migraines from bananas (ok.. It’s me) is there a suitable sub in? Looks great! I want to take them on a journey. How long will they keep outside the fridge? Great question! It all depends on what the environment is like (warm, cold, humid, dry) but I’d say a couple days at least. Try cooked sweet potato in place of the banana if banana gives you a migraine. I have used that on brownies that called for the banana. Oh that’s a really interesting idea! I’ll have to give it a try sometime. Thanks! I may have missed it but how many is considered a serving? 1 cookie is a serving!